They honoured the dead, fostered unity and demonstrated the truth of the inclusive ‘us’. Their Prime Minister, Jacinda Ardern, embraced the whole of the nation’s heritage and culture: of those that have come in recent times and of the ancient culture of the Māori people. We, in Australia, watched New Zealanders drawn intuitively, and possibly at an unconscious level, to the ancient centre of themselves. As the people of Christchurch expressed the intangible ‘us’, the power of the Haka reverberated around the world. Though Australians may not understand the gesture well, many are drawn to envy New Zealand’s link with ancient culture. In the overwhelming grief and pain of the tragedy, we see the Haka expressing pride, strength and unity. Australia’s ‘new settlers’, those who have arrived in the past 240 years from the European Union (EU), Asia, the Middle East, the Americas, Africa and the Pacific, are gradually discovering the 60,000 years of culture in this country. Systematic research has, for some years, charted Australian attitudes to the First Nations of this land. Results are published as ‘The Reconciliation Barometer’. The most recent posting indicates that 90% of Australians now believe that our relationship with Aboriginal and Torres Strait Islander people is important, and 79% agree that Aboriginal and Torres Strait Islander cultures are relevant to Australia’s national identity. The Reconciliation Barometer is read every two years and the recognition of Australia’s Indigenous culture continues to rise. Gradually, though belatedly, many Australians are acknowledging it. In May 2017 representatives from all Aboriginal Nations across Australia and the Torres Strait Islands met in Uluru and issued, with the overwhelming support of this historic gathering, a powerful ‘Statement from the Heart’. They invited all Australians to claim the heritage of the land. Given that Australia was settled without Treaty, there are two sentences that I find most poignant. ‘When we have power over our destiny our children will flourish. They will walk in two worlds and their culture will be a gift to their country’. The entire Statement was summarily dismissed by political leaders of the time, but will eventually be seen as a defining moment in the history of Australia. I cannot help comparing Australia and New Zealand. 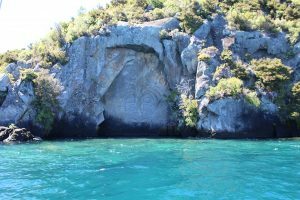 Right image: Mine Bay Māori rock carving of Ngātoroirangi on Lake Taupō, New Zealand. Used with permission. 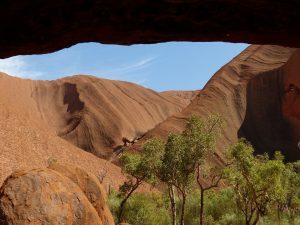 Left image: Outback Ayers Rock Uluru Landscape Australia obtained from Max Pixel. Used with permission.